I never had straight teeth and because of that was never smiling on pictures. I've researched about veneers and how theycorrect the smile since braces was not an option for me. I went for consultation to see what can Dr. recommend to me. He went over all the pros and cons. Apparently veneers was not the option for me but crowns can fix it. 3 weeks later I had that perfect smile that I was always dreaming about. My teeth look so natural. The color shape everything. Highly recommend. I never had straight teeth and because of that was never smiling on pictures. I've researched about veneers and how they correct the smile since braces was not an option forme. I went for consultation to see what can Dr. recommend to me. He went over all the pros and cons. Apparently veneers was not the option for me but crowns can fix it. 3 weeks later I had that perfect smile that I was always dreaming about. My teeth look so natural. The color shape everything. Highly recommend. I had my first visit today for check up and also wanted Dr. M to check my tooth that been botheringme for long time. Dr. M was very nice and polite and explained the procedure clear to me. I needed root canal done. He did the root canal same day. It was painless. I did not feel anything. And I am a baby when it comes to dentist. I highly recommend Dr. Marinchenko. Also the office is very nice and clean. The staff are nice. Explained the way my insurance works and what it covers so I would not have any surprises at the end. Highly recommend this office. I had my first visit today for check up and also wanted Dr. M to check my tooth that been bothering me for long time. Dr. M was very nice andpolite and explained the procedure clear to me. I needed root canal done. He did the root canal same day. It was painless. I did not feel anything. And I am a baby when it comes to dentist. I highly recommend Dr. Marinchenko. Also the office is very nice and clean. The staff are nice. Explained the way my insurance works and what it covers so I would not have any surprises at the end. Highly recommend this office. To make an appointment please call the office at (215) 725 1608. Dr Marinchenko has graduated Rutgers School of Dental Medicine in 2012. He is working with patients of all ages, is proficient in performing regular checkups and complex dental procedures and is committed to the highest quality of patient care. 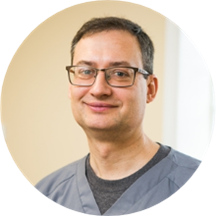 Dr. Marinchenko is extremely familiar with all of the latest in computer-based dental technology and he used much of it in the office. He is a painless dentist, which is one of the things that made him so popular. Very happy I got my cleaning and fillings done here. Dr. Marinchenko did a great job. Professional and friendly environment, which is important in places such as dental office. I will highly recommead this office. Dr. M is amazing. Took time to do my exam and explained everything. He also did my dentures bottom ones. They look naturally. The staff are pleasant and office is very clean which is hard to find in Philly area.